Marketers will try anything to get customers to buy the product/service that they are selling. In a fiercely competitive environment, one has to come up with smart marketing ideas and get creative. One such technique is the decoy effect that we all encounter on a daily basis but probably do not pay too much attention. Here’s the idea in a nutshell: If you want to sell more of a product, offer your customers a similar but slightly more inferior product in the same price range. Sounds pretty counterintuitive, even borderline stupid right? Turns out this tactic actually works like a charm! Dan Ariely, who conducts extensive research in behavioural economics, ran a little experiment to see how it actually plays out. 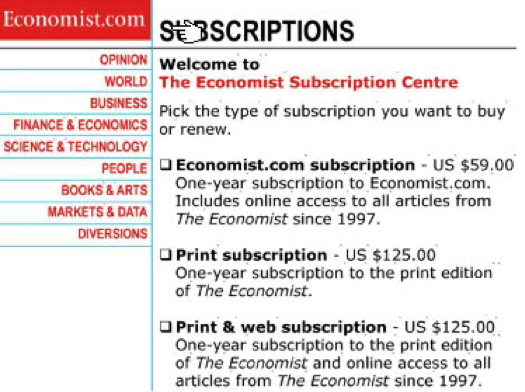 When he came upon a banner on the Economist magazine’s website, advertising their subscription plans, Ariely could not make sense out of the two plans that were priced exactly the same but one of them was clearly a much better alternative. Puzzled by this, he created two versions of this ad, one that included ‘print subscription’ and one that did not. One group was shown version 1 and the other group was given version 2 to decide which subscription model they prefer. The results are quite interesting. When people were asked to choose from all three options, 84% of them said they wanted the print & web subscription, 16% went for the online-only plan, while not a single participant signed up for the print subscription, which clearly provided no value. It all makes sense so far. Here’s where it gets interesting: When the subjects were given only two of these options (online subscription or print & web subscription), 68% of the respondents chose the online option while only 32% said they would go with the print & web alternative. By simply adding a third price plan (decoy), the company has increased its sales significantly in the first scenario, even though the decoy plan had no subscriptions. The decoy effect works for a very simple reason: relativity. Human brain is designed to think in relative terms. We as a species have an extremely hard time processing information in absolute terms. In this case, introducing a less attractive version of the product that you actually want to sell makes the superior version of that product look even more attractive. Not just relative to its inferior, but also to other products. Imagine a new product being launched. It is a brand new technology and nothing like this has ever been done before. It is so unique that it doesn’t even belong to any product category that we know. As a consumer, how do you decide what a fair price for this product would be? You have no anchor point, no benchmark, no reference. This is exactly how the decoy effect works by creating an anchor (the inferior product) so that the consumer can value the other options relative to that. Its simplicity is why it is brilliant.